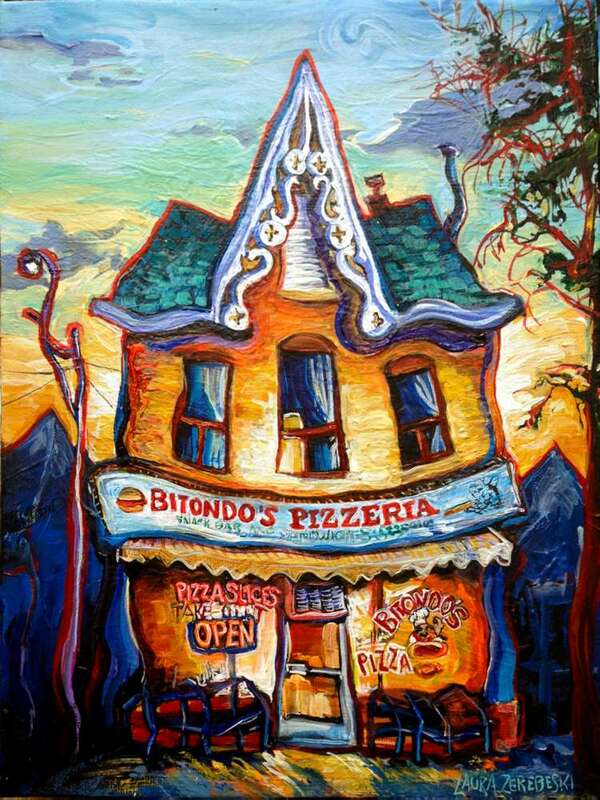 Bitondo’s Pizzeria is a no-nonsense thin-slice pizza joint in Toronto’s Little Italy. The outside is a classic College Street character house while the inside features a few bright orange and beige plastic chairs, sixties-era ceramic tile, Italian soccer pictures, and a Ms. PacMan arcade game. It hasn’t changed in years, thankfully. I painted it on a late winter-darkening afternoon in the manner of Tom Tompson’s “Jack Pine”, which is a favorite painting of the recipient. You can see the red underpainting, dark blue shadowed neighborhood houses, and even an actual pine tree off to the side. The effect is of a glowy favorite neighborhood place full of warm ovens and tasty smells that welcome you in after a long day of work and study.